Prison crowding continues to plague most prison systems. More importantly, it is highly unlikely that the crowding problem will soon disappear. Reducing prison terms is, however, a controversial approach to curbing prison crowding. While the prison system directly benefits from lowered prison populations, there are several potential negative reactions that may result. Crime rates may increase as more prisoners are released ahead of their normal release dates. More importantly, the public may become further disenchanted with what it already perceives as an effective and overly lenient criminal justice system. 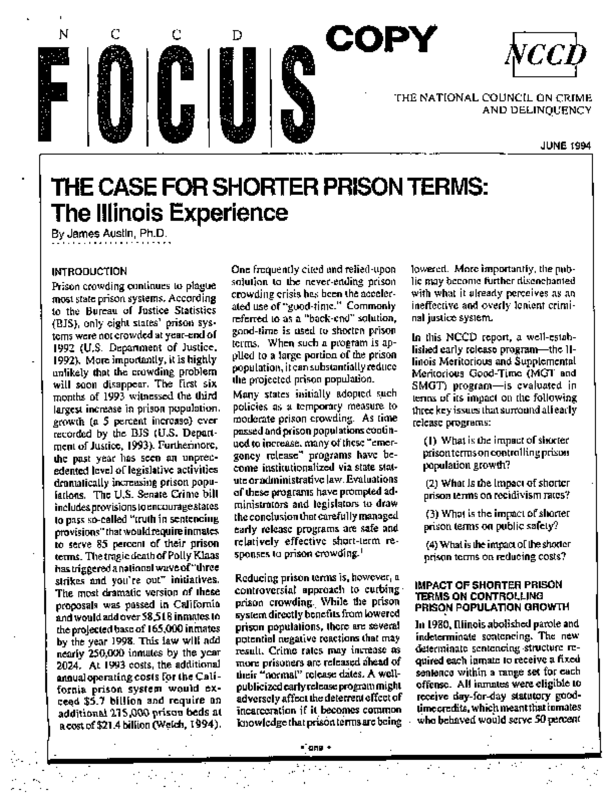 In this NCCD report, a well-established early-release program, the Illinois Meritorious Good-Time program, is evaluated in terms of its impact on the following four key issues that surround all early release programs: (1) What is the impact of shorter prison terms on controlling prison population growth? (2) What is the impact of shorter prison terms on recidivism rates? (3) What is the impact of shorter prison terms on public safety? (4) What is the impact of shorter prison terms on reducing costs? Copyright 1994 National Council on Crime and Delinquency. All rights reserved.